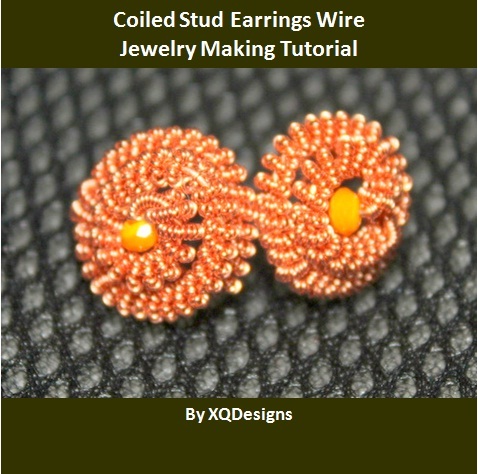 I’m sure by this time you’ve perfected your coiling technique the way we taught you in Part 1 because today, we’re going to finish and use your coiled copper wires to create the earrings. Step 7: Cut 35 inches x 0.3mm (28 ga) copper wire. Take your 1mm (18 ga) copper wire and wrap the 03mm (28 ga) at least 5 times beside the bead, pushing or securing the bead near the loop. Step 8: Take one coiled wire and slide it into the wire attached onto your 1mm (18 ga) copper wire like shown in this picture. Step 9: Then wrap the coiled wire onto your 1mm (18 ga) copper wire. Again, wrap the coiled wire with even tension to avoid lose or tight wires and/or spaces in between the coils. Keep wrapping until you reach the end of the coiled wire. Then slide in another coiled wire and continue wrapping again. When you reach the end of your 2nd coiled wire slide in the 3rd coiled wire and wrap again. Step 10: When you’re finish wrapping the 3rd coiled wire, continue to wrap the excess 0.3mm wire at least 5 times like what you at the start or in Step 8. Cut excess wire. Step 11: With your round nose pliers, bend the wire and create a big loop. Then using your thumb and point fingers, continue bending and coiling the whole piece like shown in this picture. As you continue to coil, try to push the center upward to form the dome shape. Step 12: When you reach the end, bend your 1mm (18 ga) wire, crossing the center like shown in this picture. Step 13: Then bend the wire near at the center and create an “L” shape. Cut off excess wire at 1.4 cm (0.55 inches) neatly. You can have the complete pictoral step-by-step tutorial by clicking this DOWNLOAD LINK and you can go back anytime for Part 1 with this LINK.